Most homeowners regard raccoons ask cute and harmless critters- that is, until they make their way into their homes. Once they get in, normally through holes in your roof, it can be quite challenging to remove them. And while they’re there, it won’t be any trouble for them to ruin your home. If you attempt to remove them on your own, the raccoons can become hostile and lash out; resulting in serious injury or the spread of disease. The best way to remove raccoons from your home is to hire the professionals at Critter Control® Gainesville. We’re trained in quickly and safely removing any unwanted critters from your home. It may seem cheaper to deal with raccoons by yourself, but the dangers that come with DIY removal aren’t worth the risk. Additionally, you may end up paying more on failed attempts to trap raccoons than you would with a professional service. 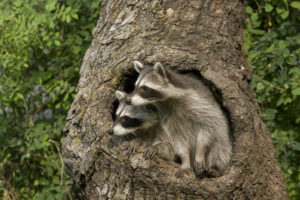 So trust our professionals at Critter Control® Gainesville to remove all raccoons from your home. We’ll ensure they stall out as well by sealing up any entry points around your home. For a free estimate, call us today at 352-372-3922.